It’s midnight, maybe half past midnight, and I just drove up to Saratoga County on what was essentially a lark. Or, as I like to call it, a dress rehearsal. At some point in time this summer, I’m planning on returning to the Boreas Ponds and capturing the photograph of my dreams. But if I’m going to do that, I need to make sure I have all my variables contained. I need to make sure all my equipment is ready. Tip top condition, one would say. I checked the calendars. There would only be a sliver of moonlight in the skies. I checked the weather reports. Clear in the Adirondacks, no clouds anywhere. I checked my Nikon Df. Batteries fully charged and ready to go. I checked my Irix 15mm f/2.4 lens. Looks clean and ready for action. I checked my watch. I couldn’t get to the Boreas Ponds this late at night – certainly not on a weeknight – but I could hit a dress rehearsal area. Next stop … the Corinth Reservoir. The Corinth Reservoir is my closest “dark sky” locale. It’s tucked off Route 9N in Corinth, there are no overhead street lamps in the general vicinity, and the hike to the Reservoir from the parking lot is barely a half of a mile. By the time I arrived at the Reservoir, it was maybe 11:30 p.m. Decent time for photographing the night skies. This would be my dress rehearsal. If I can get a decent night sky shot right now, then I can make any necessary adjustments before I undertake the Boreas Ponds journey. Nikon Df on the tripod. Irix lens on the mount. Settings – full open throat, f/2.4, ISO 6400. A Vello-branded computerized shutter release activated – by calculating the photographic rule of 600 (600 divided by focal length of lens equals exposure time), I knew that this lens could provide me with 20 seconds of tack-sharp imagery per shutter exposure. Milky Way, Corinth. Nikon Df camera, Irix 15mm f/2.4 lens, 20 seconds at ISO 6400. Photo (c) Chuck Miller, all rights reserved. Jesus!! And that’s on the first freakin’ shot!!! Big fat Milky Way, and that’s taken right from the freakin’ parking lot of the Reservoir! All right, Miller, let’s not completely freak out. Now comes the hike to the Reservoir itself. A few minutes later, I arrived at the glistening, calm reservoir waters. I have to work fast, I didn’t ask permission from the Town of Corinth to be here overnight, and as much as I know I have blog readers who enjoy my writings, best not to overstay my welcome. These were just straight out of the camera, and I got this. Milky Way 2. Nikon Df camera, Irix 15mm f/2.4 lens, 20 seconds at ISO 3200. Photo (c) Chuck Miller, all rights reserved. Note to self. 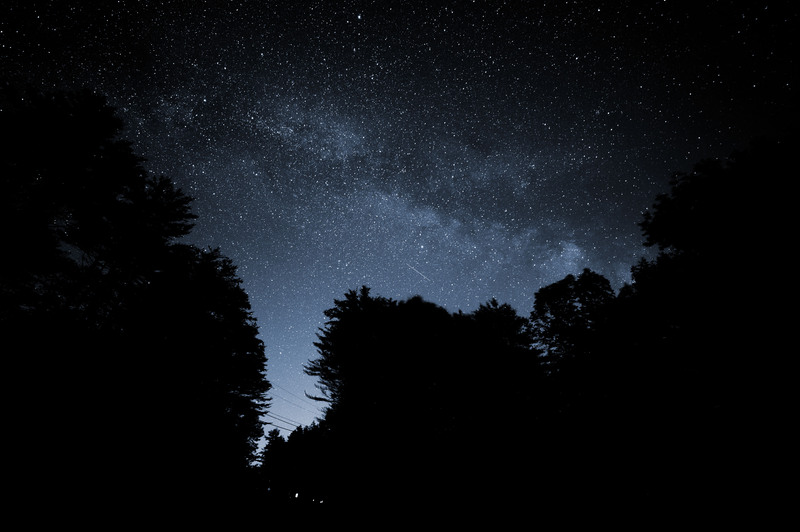 Milky Way shots don’t look so great when you’ve got light pollution coming all the way from Saratoga Springs. Urgh. You can see the Milky Way … just barely. Okay, back to the parking lot. I still gotta go home and write a blog post and go to work in the morning. And I’m already feeling sleepy. Wait a second. How can I prove I was actually at the Corinth Reservoir getting Milky Way shots? 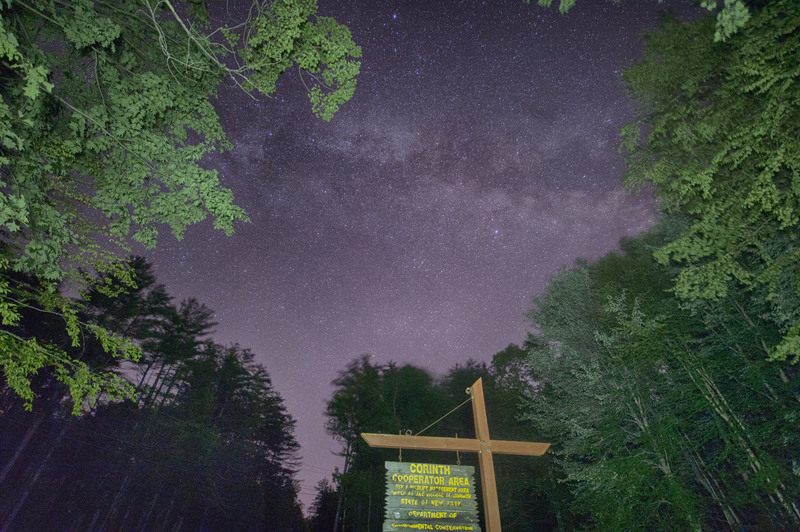 I could take a photo of the Corinth Reservoir signage … but how to get it with the Milky Way in the background? I used the flashlight on my cell phone to “light paint” the Reservoir sign, while still capturing the Milky Way in the distance. A few tries, and this was the best shot of the bunch. 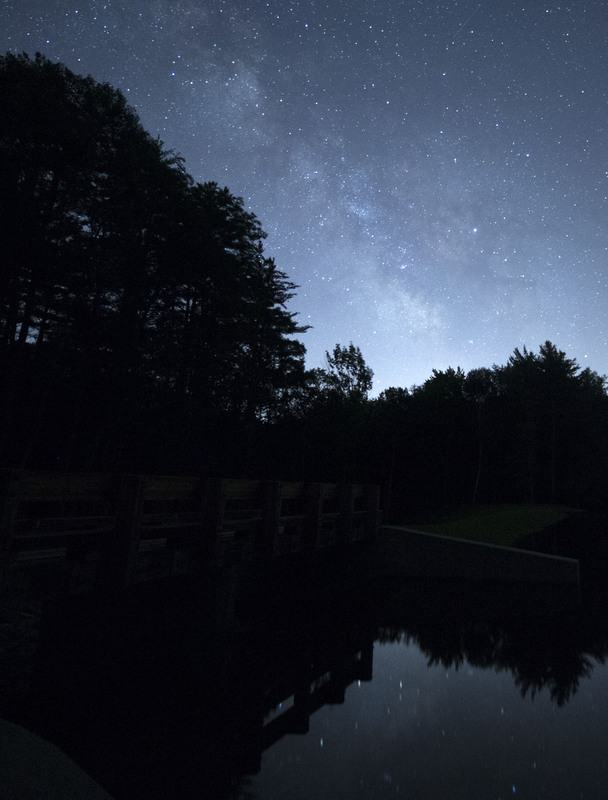 Corinth Reservoir with Milky Way. Nikon Df camera, Irix 15mm f/2.4 lens, ISO 3200 for 20 seconds. Photo (c) Chuck Miller, all rights reserved. I would say that with shots like this … my test run was a success. I still need to make adjustments, though … gotta get a REAL flashlight, not just the one from my cell phone – and a few other tweaks and twists. But at least I know that from this dry test run, i can make an amazing shot the next time I visit the Boreas Ponds. And I hope that day comes very, very soon.